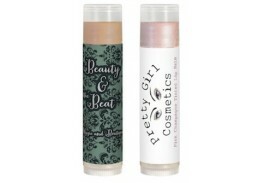 Add some sparkle to your promotion with a tinted organic lip balm! Made in the USA with Organic ingredients including Sunflower, Castor Seed, and Coconut Oils, as well as Beeswax, Vanilla Flavoring, Aloe Vera Leaf Extract, Candelilla Wax, and Vitamin E, this promotional tinted chapstick is Non-GMO, and gluten, petrolatum and cruelty free. This tinted lip balm is flavored with peppermint and vanilla, and comes with a Shimmer, Pink Champagne, Crimson, Bronze, Plum or Raisin tint. The natural minerals provide a glistening lip moisturizer to keeps lips looking as good as they feel! 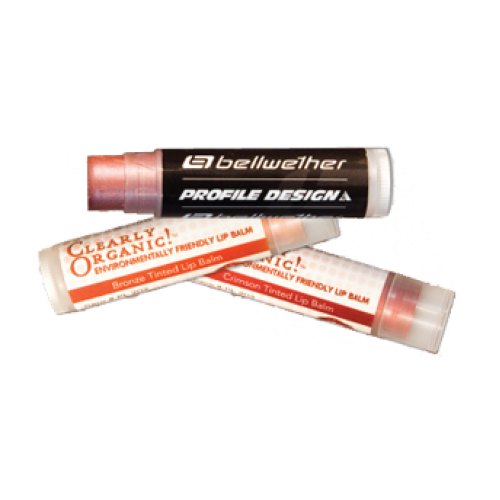 This tinted organic lip balm comes is a standard clear tube and cap, with a full color process label so make your logo pop. Custom cap colors are available in Red, Yellow, White, Black, Green, Blue, Tan, Orange, and Pink for only 10¢ per piece. Promotional tinted chap balm makes a great giveaway for tradeshows and marketing events, and this tinted balm is perfect for any business including spas, salons and dentist offices.